This looks an awful lot like my Samson, save for the throw-off which mine doesn’t have. 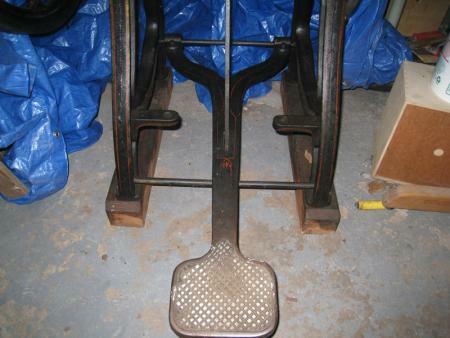 If so, you’re missing the foot treadle and part of the feedboard. I’ve attached a not-so-good photo of mine to help with some comparison. Also, you should contact Rich @ One Manger Press on the board here. He’s got the same press with a throw-off. He’s also got better photos! If this is a Samson, then you’re only the 2rd other person aside from Rich that I’ve found with the same press. 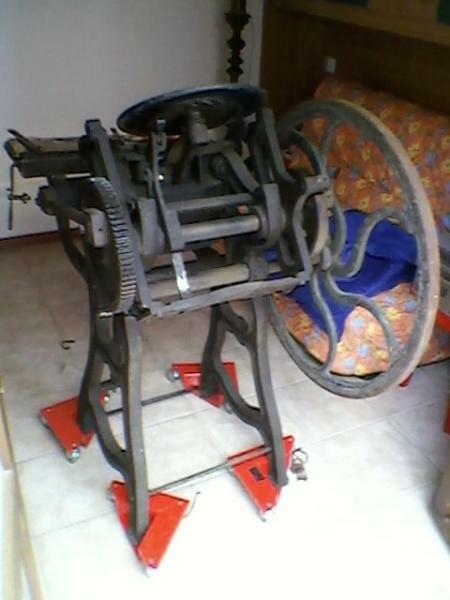 My press has two springs that help to pull up the weight (there is only one in the photos). If you’d like, I can try to get some more detailed pictures. Any areas you’d like to see? 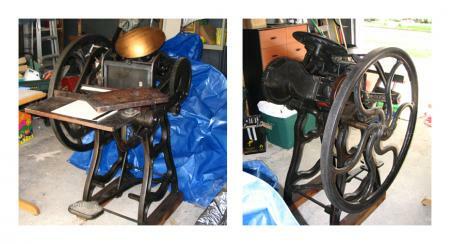 It’s hard to tell from the photos but do you have the roller assembly? Email me off list if you’d like. It looks like both your press & mine have had the arms marked “Samson” replaced—it does make it hard to identify the press. I’m not actually sure how those springs function; I’ve got them, unattached, but they don’t *seem* that critical to the operation—although, as of now, I have to hand push the wheel to make the press rotate through—my treadle isn’t missing, just broken! I’m not sure, with regard to the “I also have a broken foot that appears to be outside to lock the wheel,” what you’re talking about? 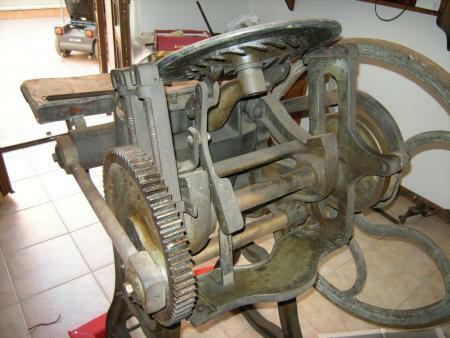 Either Jon or I could send you roller & truck dimensions, which would make your press operable. I have one that looks quite a bit like this one, only I believe is was called The Favorite. 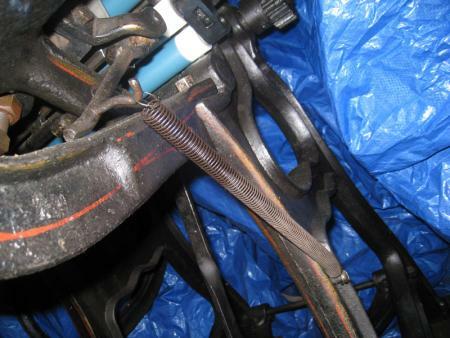 Mine has one of those gangly feed brackets - plus a cobbled-together replacement. But it also has that damnable spring that almost cost me some fingers when I reinstalled it. Mine has a 6x10 chase and only one spring - on the left side, whereas yours has two. Do any of you know of any relation between the Favorite and the Samson? Neat dollies, btw. Where can I get some of them? I would put it back in operation making me redo the parts that are missing. I realize you’re not in the US, but you could try to contact Fritz Klinke at NA Graphics in Colorado. He supplied me with new rubber rollers and trucks, albeit on my cores. If you need cores too, let me know what measurements you need and I could get them. Fritz may also have that information in his files. I’ll try to get some more pictures today if possible. The press is buried in a corner of the garage right now which makes decent photos somewhat difficult. Unfortunately, I don’t have a brake—maybe Jon does & can get a picture for you. Without seeing the side of the leg, I wonder if there are marks where the brake assembly had broken off or was bolted on. Maybe it’s a case of welding it back on? 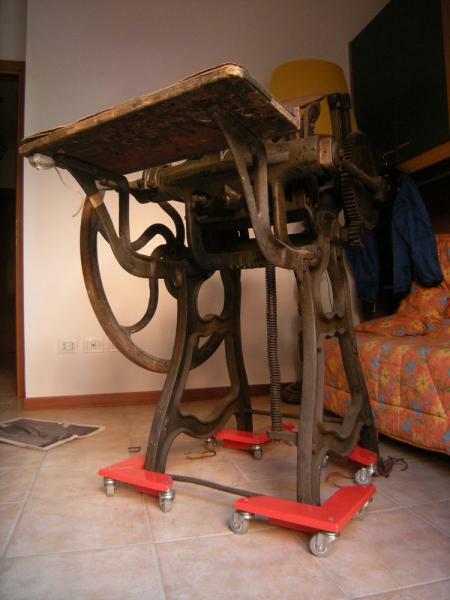 you know where I can buy a pedal to operate the press? or if there is someone who reconstructs the pieces? 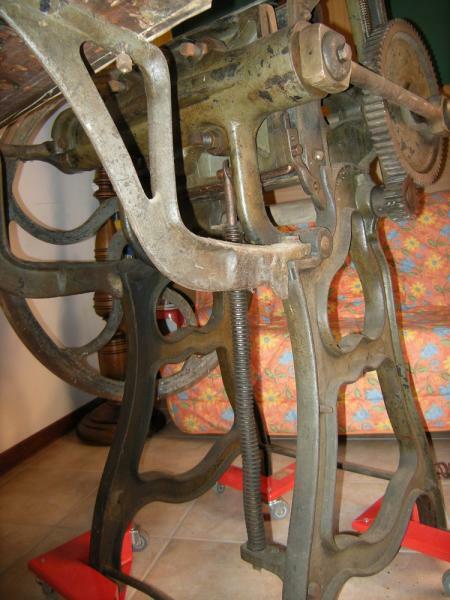 It’s possible that if your press were motorized at some point, maybe the treadle was removed and the spring added to keep tension to a certain level. Just guessing here, though. Edited to note: The photos are appearing in the reverse order I intended. Beneath the treadle itself you can see where the hook bar connects to the pedal. 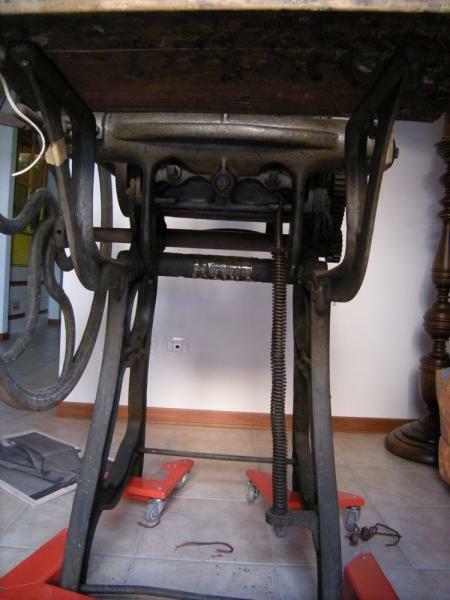 The view looking up and back at the hook that connects the platen assembly to the treadle. This is looking from the rear of the press forward (you can see the rollers). And here is the right side. 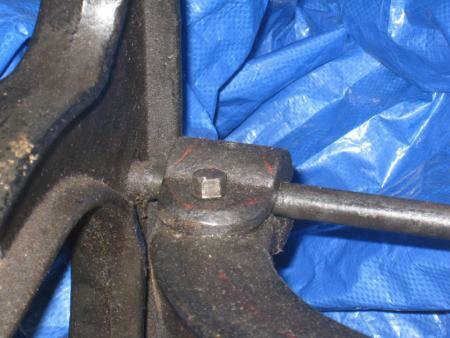 This is how the treadle connects to that rear bar that runs between the left and right lefts. This is the left one. 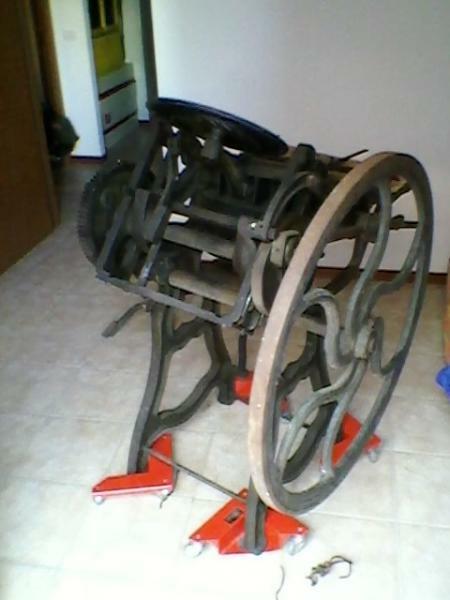 Front view of the treadle. 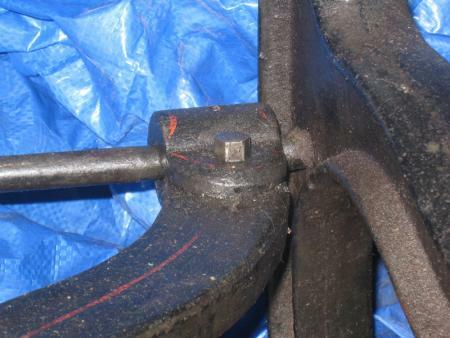 It doesn’t look like your Samson has an eccentric shaft (you’ll notice in J’s pics that the main shaft under the press has an odd notch in it, for the treadle hook). I’d echo J., in that it was probably motorized, and would need to be motorized again in order to run. You could always hand turn it, I suppose—but that’s quite a bit of work. (I’m Baires. 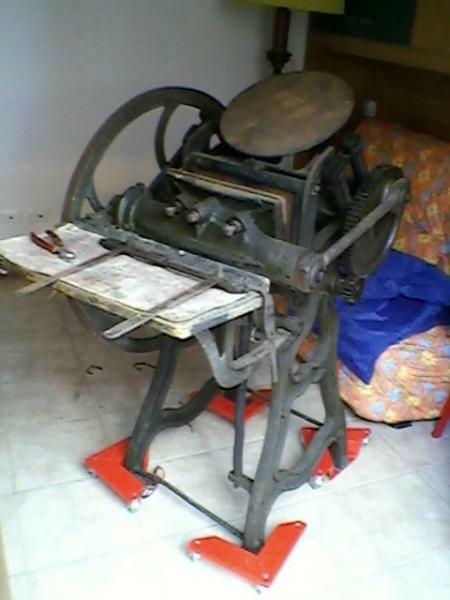 My father Giorgio is the owner of the press) but we are both interested in printing machines. that leaves me dubious of “onemangerpress” hypothesis is that the brake should push on the belt that would turn the wheel …. the belt should be attached to the engine! However inside is straight and has no connection to the pedal that’s for sure! I don’t really know anything specific about these particular presses but why let that stop me from a few comments? The foot pedal for the brake seems to be designed to move the pad on the other end of the assembly so it presses against the flywheel which is not unusual at all for press bakes. 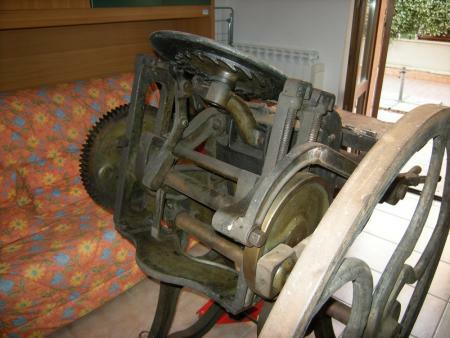 Pressing against the belt would be useless and in any case, this press is designed to be treadled and there is no belt. 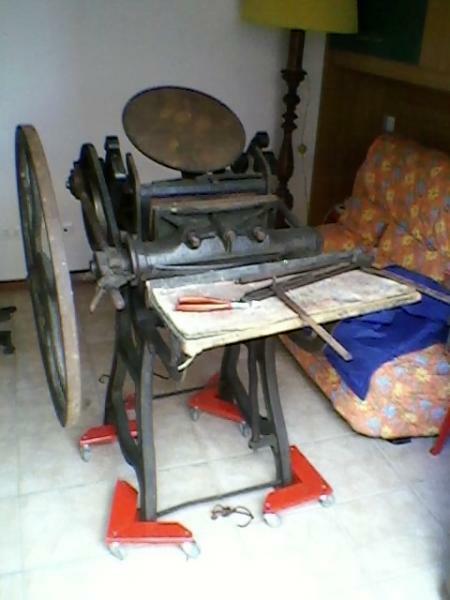 As far as the spring on the one side goes, I don’t know why a spring would be needed to help cycle the press. It may have something to do with the grippers. 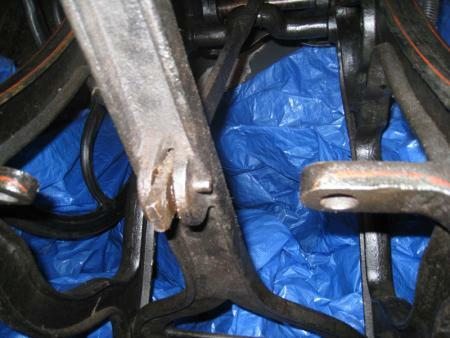 C&P presses have a rather strong spring operating the gripper bar though it is mechanically differernt and in a different location. 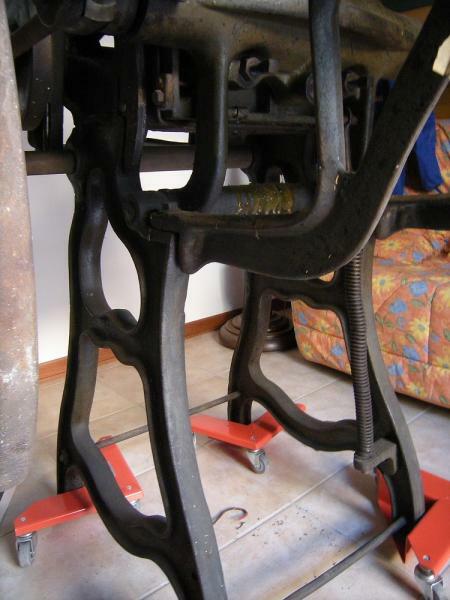 Since the one press has two spring brackets and the other one, perhaps one is broken off or the size or model press is different, even though they are in the same family. The gripper bar assembly seems to be laying on the delivery table in the first few photos and looks large enough to need a good sized spring, or two. The springs encircle two metal rods that fit into spaces on the bottom of the platen-half of the clamshell; they sort of help the clamshell snap back up into place; I tried them & it almost cracked my press in half, because I put too much spring around the metal rod—and the clamshell couldn’t open all the way, but really really wanted to. I suspect they really aren’t necessary for operation. Maybe I’ll try them w/ less springs sometime. It think it would just snap that platen closed way too fast. Re: the brake; I don’t recall saying that it should press against a belt—if I did, I’m sorry. It would have to press against the wheel, or something like it (as a C&P brake does). Here’s a photo of the gripper spring, on the right side of the press. Maybe Baires’ model is of a different vintage and design. 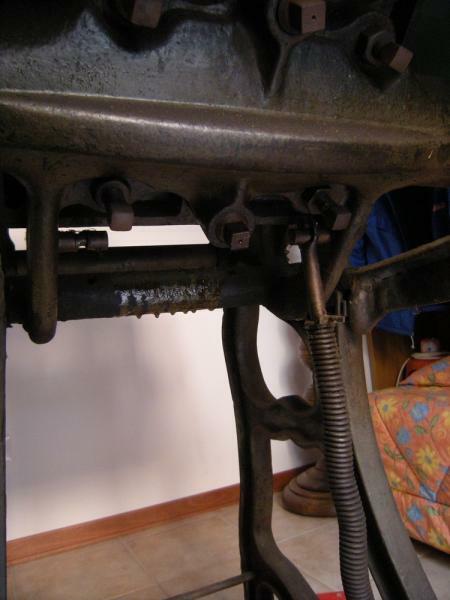 In my post I was actually referring to the pair of springs+rods (baires only has one) that fit inside those two studs with holes (w/c) that are near the treadle on the front of the press (your picture “front view of the treadle” shows them perfectly. 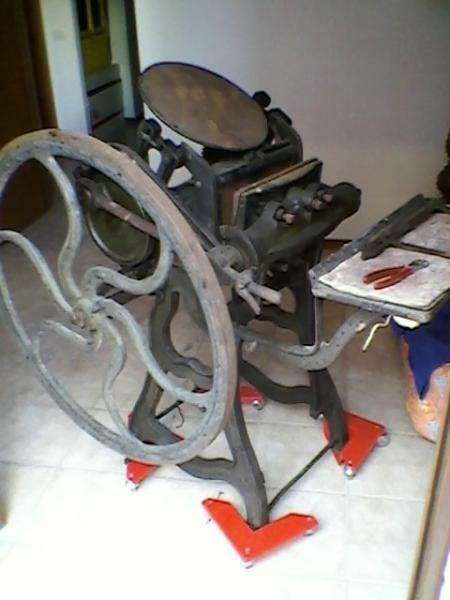 On my Kelsey Union press, there are two springs and rods similar to the one in the picture labelled “spring” above. I think they are intended to give a bit of upward thrust when the platen is at the bottom position and assists the flywheel with getting the motion started up after opening. I can give my treadle a kick or two and the press will continue on for several revolutions, so the springs must provide ample extra power. You can get a glimpse of the Kelsy arrangement (although from the side) in the Briar Press Museum site under platen presses. 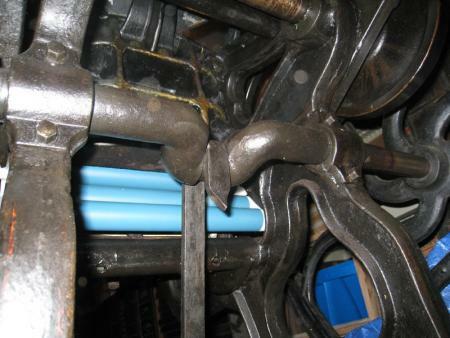 That’s what I think these springs do; I ran the press w/ them once—and had too much “spring” on each rod—nearly cracked the base of the press in half as the platen tried to lower. whoops. 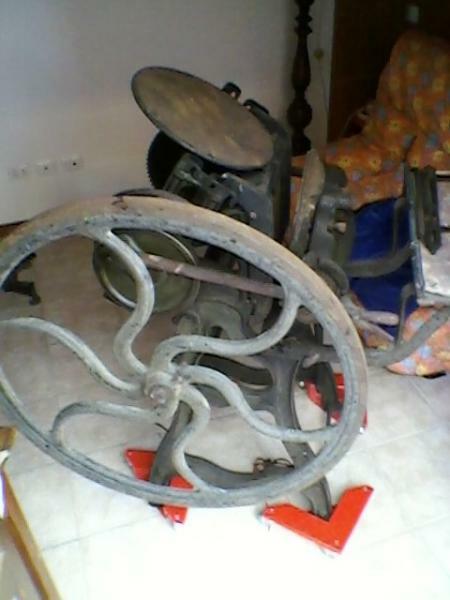 my printing press has the right side spring like photo’s press.